Hello and welcome back! Here we knocking on the door of 2017 and as I sit and remember this year and all the good times and new experiences I’ve had, one of the highlights has to be working with Lindsey of Tonic Nail Polish. 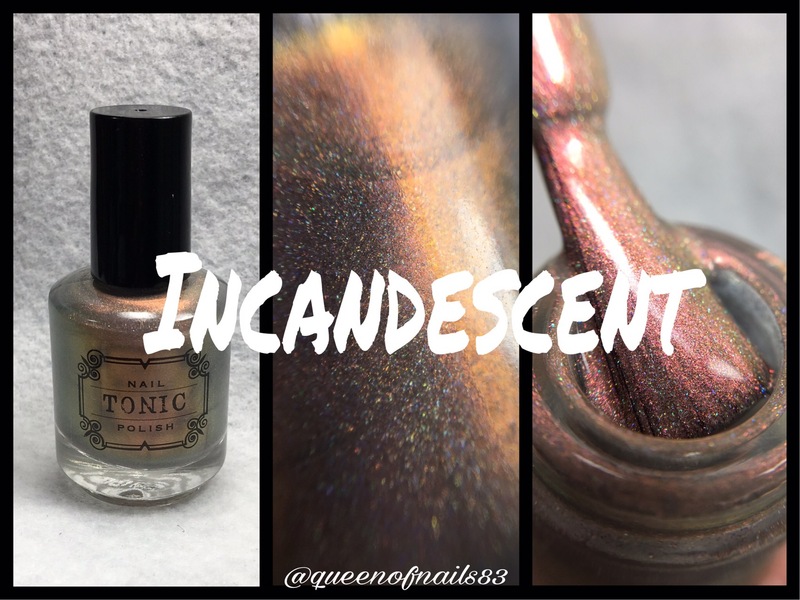 You might call her a magician when it comes to polish and that would be an accurate statement but truly now swatching the 4th collection from Tonic, I’m still in awe at her work and each masterpiece she creates. From collection 1, as I unbox each polish, the same thought comes to mind, ‘this is my favorite!’ But how could it be that every polish you see you love?! It’s like finding something you didn’t know you were missing and trust me, this collection does not disappoint. It is with great excitement and joy that I give you Tonic’s Holiday 2016 Collection!! multichrome that shifts to purple, red, and even gold at the furthest angle, sparkling scattered holo that doesn’t dull the color shift, and a sprinkling of tiny silver holo micro glitters. 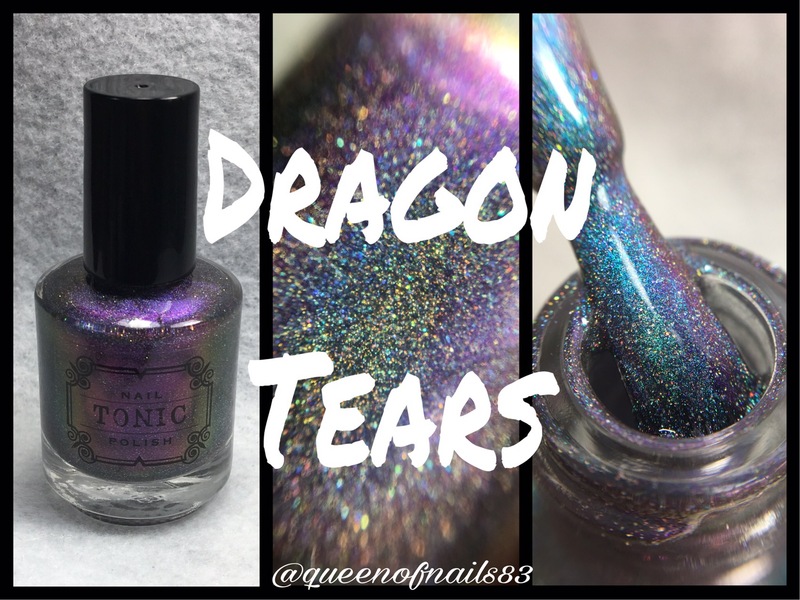 Dragon Tears is made from the shiftiest multichrome pigment found, it shifts through a whole rainbow of Green-blue-purple-red-peach-gold-and back to green at the furthest angle. It has a sparkling scattered holo that does not dull the color shift and a sprinkling of tiny silver holo micro glitters. 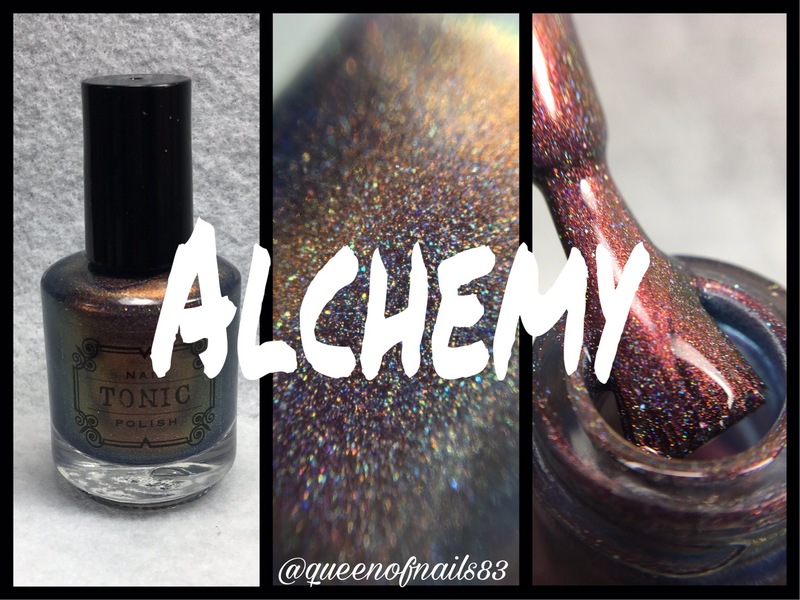 Alchemy is a red/pink-orange-gold shifting multichrome with a blue/purple shadow. It has a sparkling scattered holo finish with tiny silver holo micro glitters. Incandescent is a metallic ballet pink multichrome that shifts to peach and icy lemon yellow with a subtle scattered holo sparkle. Luminescent is a metallic aquamarine multichrome that softly shifts to pale blue and lilac purple with a subtle scattered holo sparkle. 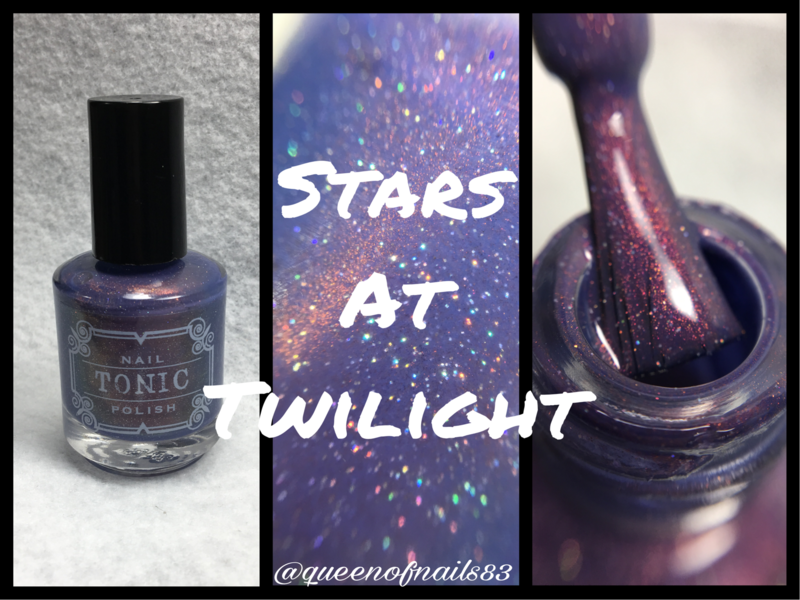 Stars at Twilight is a dark denim blue cream with red/pink-gold shifting multichrome shimmer and silver holo micro glitters. Formula: ♥♥♥♥♥ 5 out of 5 – ideal formula and great consistency. No issues to report. Application: ♥♥♥♥♥ 5 out of 5 – smooth like buttah. Polishes are super easy to apply and work with. Opaqueness: ♥♥♥♥♥ 5 out of 5 – opaque in 2-3 coats. Overall: ♥♥♥♥♥ this collection is getting a 5 out of 5 because as I stated in my first S&R of Tonic’s Debut Collection, this is a brand to BUY EVERYTHING from!!! If you follow me on IG then you know I love this entire collection but Alchemy has my heart!! 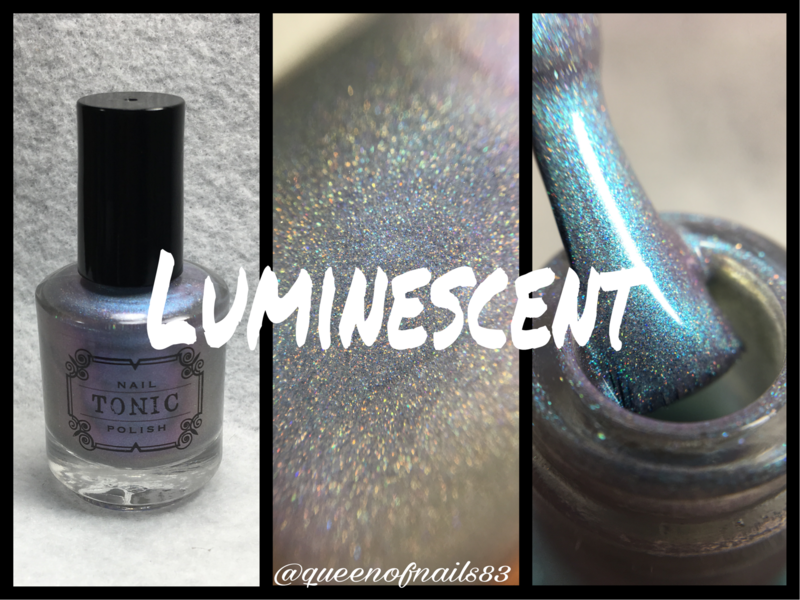 Tonic Holiday 2016 is releasing December 4 at 2:00pm CST so be sure to set a reminder AND alarm!! Tell me in the comments what Tonics you own and/or which you plan to pick up? I am wearing Watcher’s Woods now, and I have to tell you, I was looking like a fool in the Publix parking lot yesterday. I was twirling around in the sun beam trying to find the blue that I knew I saw when I was driving. I have never met such beautiful shifty polish in my entire life! Dragon Tears is so gorgeous! I need some of these, for sure. All of these are absolutely beautiful! Incandescent just glows. These are so gorgeous, I love how they look matte too!! Her polishes are just so GLOWY! I love it! They are ALL faves! Goodness, they are so gorgeous! Oh my GOD this collection is gorgeous! And your macro shots are to die for!!! Tonic has to be the best new indie this year!